UTRGV Xavier McDaniel Jr., and Dan Kimasa defend Utah Valley's Jake Toolson during the first half of a game at UTRGV Fieldhouse on Thursday Jan. 18, 2018, in Edinburg. EDINBURG — UTRGV’s Xavier McDaniel Jr. has been trying to build a better daily routine, right down to the drills he does before and after practice. He said he hopes a more habitual schedule will help him become a more consistent player — the biggest shortcoming he can see during a solid sophomore campaign. Consistency was the primary focus during McDaniel’s freshman season, when he scored five points or fewer in 20 games and posted 15 points or more six times in 32 total contests. UTRGV coach Lew Hill said McDaniel has been a little more steady this year. The sophomore has posted five points or fewer in only four games (though he scored six points five times) and has scored 15 or more five times in 23 appearances. As a result, McDaniel’s season averages have increased from 7.0 points and 4.0 rebounds per game as a freshman to 10.6 points and 5.0 rebounds per game as a sophomore entering UTRGV’s game against Grand Canyon at 7 p.m. Thursday in the UTRGV Fieldhouse. “I would just like to see more consistency from him, but he’s been very solid,” Hill said. 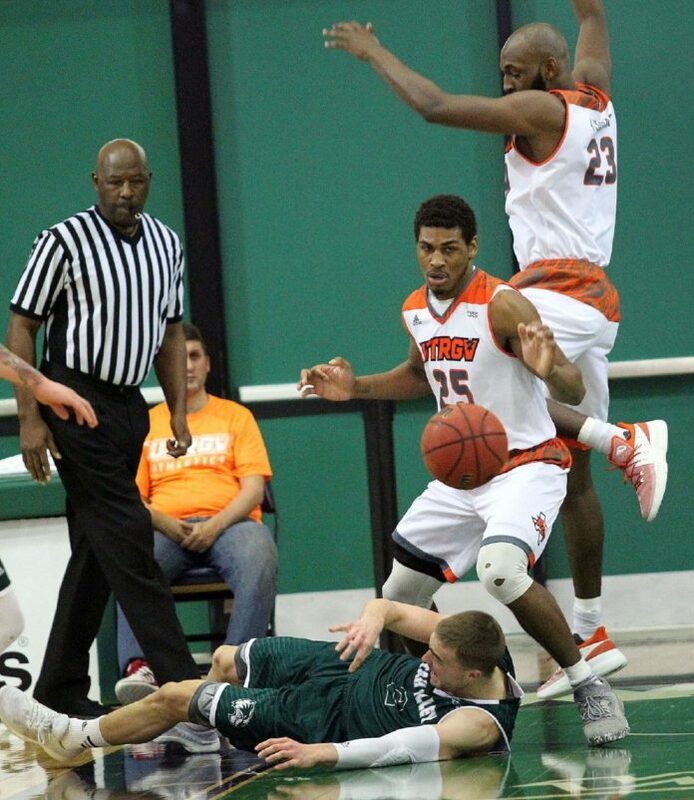 The son of Xavier McDaniel, a collegiate Hall of Famer and one of the most renown agitators in NBA history, UTRGV’s McDaniel Jr. plays better when he hears trash talk or takes exception to an elbow, Hill said. McDaniel Jr. said he feels he’s brought that fire in every game this year, but Hill said he wants more. Luckily for McDaniel Jr., UTRGV newcomer Terry Winn has been lauded by coaches and teammates for bringing that tough, physical mentality to the team. Winn joined the roster last December as a midseason transfer from UTEP but missed much of the practice time between then and his debut on Dec. 22, 2017, due to a knee injury. As Winn has progressed to become a full participant in practice and games, McDaniel Jr. said the two “go at each other’s heads” during workouts. Winn said McDaniel Jr. has sharpened his game in all areas compared to when the two first practiced together last year. A redshirt junior, Winn said he envisions McDaniel Jr. eventually taking up the mantle as the player to bring physicality, energy and toughness to UTRGV. Winn wants McDaniel Jr. to let loose when he attacks the glass, channeling the energy that made McDaniel Sr. the nation’s leading rebounder with 15.0 per game at Wichita State during the 1984-85 season. McDaniel Sr. still keeps a close eye on his son, visiting the Valley for three or four games so far this season, McDaniel Jr. said. His father’s biggest advice this year has been to slow down and let the game come to him — a process that is growing easier with experience. McDaniel Jr. said he has more trust in his midrange jumper than he did last season, part of the reason he’s taking more shots than he was a year ago. Combined with better ballhandling, that trust in his shot allows McDaniel Jr. to use his pump fake to draw more fouls than he did as a freshman. He’s also already blocked twice as many shots (22) as he did last season, and he attributes the change to an increased energy on defense. From Hill’s perspective, McDaniel Jr. has become a bigger, stronger player who is more willing to attack the glass to score or rebound. Hill said McDaniel Jr. wasn’t quite ready to be one of the program’s primary rebounders as a 6-foot-6 freshman, but he’s grown into the role. Going forward, Hill wants to see McDaniel Jr. continue to improve his shooting, ballhandling and playmaking ability.